You can get a massage anytime, you don't have to wait until you are injured or extremely stressed. 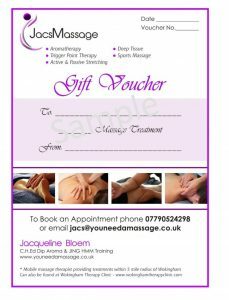 Massage is the perfect way to treat yourself / friend or family to some “me-time”. Once you have had a massage don’t leave it too long before having another one, you will get a lot more benefits from regular massage treatments. There are certain conditions that are contraindications; infectious diseases, flu’s and fever, acute injuries, open wounds, fractures, tumors, and cancers (get Doctors advice first). If in doubt ask the therapist. You can undress 'to your level of comfort'. Gym / swim shorts are usually comfortable and your therapist can work around the clothed areas. You will be draped / covered with a sheet or towel at all times during the massage, the only areas not covered are the areas being worked on. The therapist will let you know how to get on the table, and how to lie. She will then step out of the room and allow you adequate time to get ready and get on the table before she returns to the room. Private areas are definitely NOT massaged. The question a lot of people ask, “Does massage hurt?” - this depends on the pressure used. A gentle massage is very effective and will not hurt, however, deep tissue and other massage techniques get into the depth and layers of muscles and may cause some discomfort. We all have different pain thresholds and the therapist will work with you on this. If at any time during the massage the pain moves from discomfort to unbearable pain, let your therapist know and adjustments will be made immediately.